Indiana is the 16th most populous state in the United States with a population of nearly 7 million and is known as The Hoosier State. It is bordered by Ohio, Kentucky, Illinois, and Michigan. 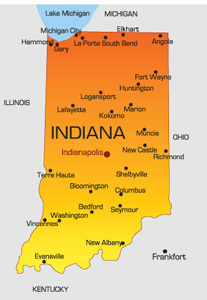 The capital city is Indianapolis that has a population of over 800,000 people. The major highways servicing the state are I-64, I-164, I-65, I-165, and I-465. Other modes of transportation include air travel out of or into Indianapolis International Airport or Terre Haute International Airport. Notable colleges in Indiana are Indiana University, The University of Notre Dame and Purdue University. You can also stop by a see a game for some family fun at Lucas Oil Stadium in downtown Indianapolis.